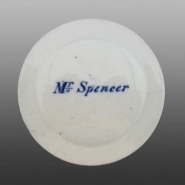 Printed on the back of this miniature trade plate is the name "Mr. Spencer", presumably the name of the salesman representing the Mortlock firm. A miniature earthenware plate printed in dark blue with the Standard Willow pattern. This small plate was made to serve as a trade card for the London retailer John Mortlock. On the front the pattern is overwritten by a scroll with the inscription: " Est. 1746. JOHN MORTLOCK. THE POTTERY GALLERIES. OXFORD ST.. & ORCHARD ST. PORTMAN SQUARE. W." On the reverse is the name of the sales representative "Mr. Spencer" (shown below). Another example has been documented with the name Mr. Narrocott. This piece was not made before 1856 since the address of the firm includes the letter "W" for West, which was one of the original London postal districts introduced in that year.